A filling really only repairs a small hole. To rebuild, reshape, or protect a substantial part of your tooth, a filling just won’t do the job, and a crown is preferred. A crown is also called a cap. Sometimes, a filling is not sufficient for long-term strength, yet there is quite a bit of healthy tooth. In this instance a partial crown or inlay is appropriate. A bridge is constructed to replace a missing tooth / teeth, and is made of crowns that are invisibly joined together. There be multiple anchor teeth (abutments) and multiple spaces (pontics) that are replaced. 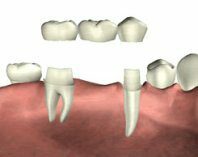 The tooth is reshaped or “prepared”, often including rebuilding part of the tooth with a crown buildup. The amount of enamel removed is exactly the thickness of the crown (about 0.5-2 mm, depending on materials used: less with all metal, more with porcelain). A mold is made of this tooth (the mold usually includes adjacent teeth and the teeth that this one bites against). From this mold the laboratory constructs your crown (the porcelain color is matched to your tooth). While the crown is being constructed you have a temporary crown on your tooth. It takes about 10 working days before your crown is back from the laboratory. At the second appointment, the crown is bonded on your tooth (you may need to have anesthesia and/or nitrous oxide if your tooth is very sensitive – that’s up to you). A crown can be made from different materials: all porcelain, gold alloy (white or yellow), porcelain and gold alloy, other metal combinations (I nearly always make all porcelain crowns; however, if a crown requires metal for strength beneath the porcelain I only use noble or high noble metals). Different situations often suggest different materials to be used depending on durability, esthetics, and physical limitations – this is determined in concert with your wishes. When a porcelain crown is made, I match the color (we refer to that as the shade) of your adjacent teeth for the new crown, so that it is not easy to detect that you have a crown. Classification of Metals: The noble metal classification system has been adopted as a more precise method of reporting various alloys in dentistry commonly used in crowns, bridges and dentures. These alloys contain varying percentages of gold, palladium and/or platinum. The temporary crown is usually made of plastic (it can also be metal), and is not intended for long-term wear – usually for 2-6 weeks (longer in certain situations). It is to protect the tooth from sensitivity (temperature, touch), protect the gums, and to hold the bite (keep the adjacent and opposing tooth from shifting). A temporary crown is like a temporary tire, it is sufficient for short-term, careful use. Brush, floss, Waterpik, clean, etc. as usual, except, when you floss pull the floss through instead of up/down, so as not to dislodge the temporary crown. Avoid sticky things that could pull off your temporary crown. The gum adjacent to a crown can be slightly irritated in the process of shaping and making a mold of the tooth. A salt water rinse is very helpful – a teaspoon of salt in a warm glass of water, rinsed gently a couple times a day, until your gum feels better. Advil / ibuprofen before the anesthesia wears off is always helpful. If it is only a day or two before your visit to try in your new crown, and the tooth is not sensitive, you can leave it out – BUT save it! If the time is greater before your appointment, you can put it back in temporarily with Vaseline, but call to have it re-cemented. Without the temporary crown on, adjacent and opposing teeth can shift, sometimes so much that the permanent crown won’t fit. At your next appointment, the temporary crown is gently removed. If your tooth is sensitive, you may require some anesthesia. Your new crown is tried in to check it for: fit, color, shape and appearance, bite, fit between teeth, seal against your tooth. If everything is correct and it meets your approval, it is cemented with a long-term cement. Treat the crown as if it is your own tooth, especially for cleaning. It is not uncommon to experience a little sensitivity to cold after getting a new crown, but this should diminish quickly (over a couple weeks). There is a process available for making a permanent crown in one-visit. 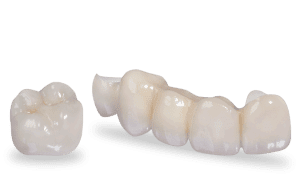 At this time I feel that this type of crown, Cerec, does not yet meet the accuracy (occlusion, contacts, anatomy) and esthetics (translucency, natural color) that my laboratory can create. If and when it does, I look forward to offering this service.